The dry desert air of southern Utah has some of the best stargazing in North America. And if you get up into higher elevations, or in winter, it’s even better. Why do the stars on colder winter nights often seem to have that extra pop? I know in the northern hemisphere winter shows a significantly dimmer Milky Way than during summer. So the stars, at least in the direction of the Milky Way, are certainly more numerous and brighter in summertime. So I’m not too sure why the colder it is, the brighter the stars appear. Perhaps it’s just perception. On this night during my recent trip through the American desert Southwest, I wasn’t too sleepy. So I went outside with my binoculars and took a look at the Orion Nebula. That glance was enough to cause me to get my camera equipment set up for a timed exposure. Besides, this was one of the reasons I came here to Kolob Canyons, a separate and not well-traveled section of Zion N.P. Take a look at my previous post for daytime fun and photos here. Kolob Canyons is the highest part of Zion, much higher than the main Zion Canyon. I was up at around 6000 feet (1830 meters) when I took this picture, but the sandstone mountains you see are well over 8000 feet (2440 meters). This is a winter night sky, so you can see in the lower right the constellation of Orion the Hunter. His belt is the three stars in a row, oriented almost vertically, and the Orion Nebula shows up brightly to the right of his belt. Above Orion in top center you can see bright Jupiter. Just to the right of Jupiter is the star cluster called The Hyades, which is part of Taurus the Bull’s face. Above Jupiter and the Hyades you can see The Pleides, that famous star cluster also known as The Seven Sisters. I recommend looking up the Greek myth surrounding all of these constellations. It’s a great story. The diagonal area of bright and dense stars is the winter Milky Way. In winter, the northern hemisphere is pointed away from the center of our galaxy. Since we are out in the “suburbs” of the galaxy, this view is much more dim than in summer, when we’re looking towards the galactic core. Nevertheless, a long exposure can bring out the winter Milky Way and make it look slightly brighter than it looks to the naked eye. Kolob Canyons, a part of Zion National Park in Utah, is well away from any city lights. Here it shows off a glorious star-studded sky on a clear winter’s evening. I took an exposure for the mountains and foreground, where my camera was dead still and tripod-bound. A half-moon (which is actually very bright) was illuminating parts of the landscape quite well, so I went with a low ISO (100) and an exposure time of a bit over 3 minutes. This resulted in an appropriate exposure for the foreground landscape. I say appropriate instead of correct exposure because if you expose as if this was a daytime photo, the foreground will come out looking much too bright for a starscape photo. I think it looks a little strange next to the darker sky. The exposure time was plenty long enough to give the stars time to form short trails. But since I don’t really like this effect (I’d rather see the stars as they appear while stargazing), I exposed a second frame of the same scene with my tracking mount turned on. A tracking mount will turn your camera slowly to keep up with the Earth’s rotation, so the camera follows the stars. But if your exposure time is much longer than 30 seconds, the camera movement blurs the foreground landscape. The solution? Take the two images into Photoshop and merge them together so you have both the stars and the landscape sharp. This was a long-winded way to say that this image is the result of two exposures of the same exact scene, merged together into one. There is on my blog a more detailed explanation of how I do starscapes, in this post. Stargazing and photographing the stars is a favorite of mine. Look for similar posts in future. The Milky Way soars over the North Cascades, with the city lights of Seattle (left) and Vancouver, B.C. behind the mountains. 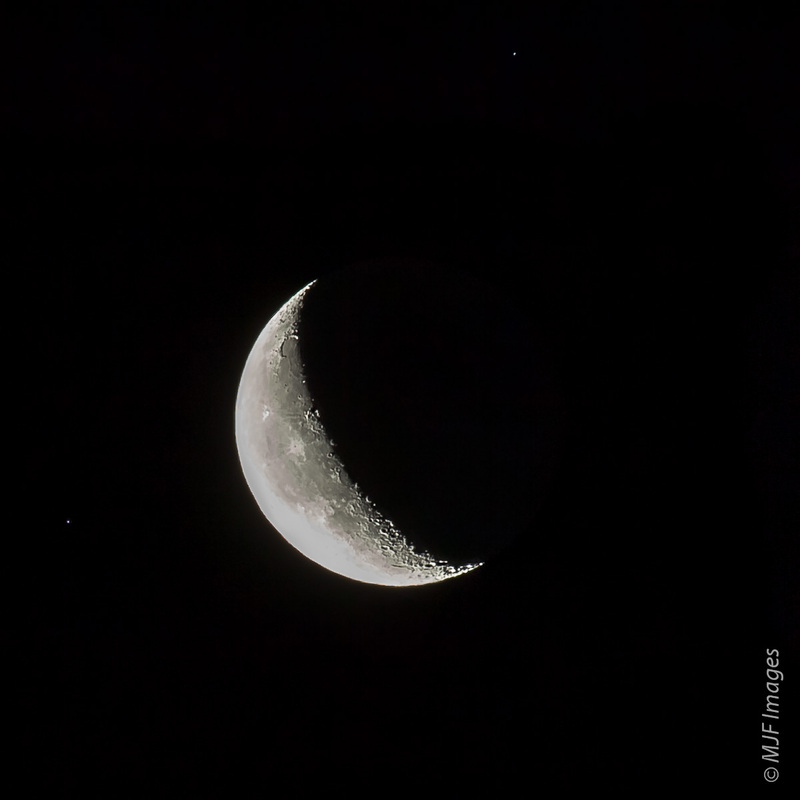 A short post on photographing the night sky. I’ve discussed this before, so won’t repeat myself. If you want some general advice on this check my post and some of the many other web resources. For some inspiration try Wally Pacholka’s site or that for TWAN. SCALE: It is so hard to show scale in photographs like this. A very common technique is to include a strong foreground element, like a strangely shaped tree, an interesting building, etc. But this is not strictly showing scale. The background in these images is still just assumed to be large – not exactly precise. It is, nonetheless, a great way to “depthify” the picture. Like that word? In the above image I was able to show the city lights of both Seattle and Vancouver, Canada, which are 150 miles apart. At first I thought the lights were messing with my desire to show a deep starfield, but then I realized that the lights actually helped with depth. It happens so often when doing photography, that you are frustrated with an element you think is interfering with your composition. The key is to take a deep breath and consider what that element is actually capable of doing for your composition. LOCATION: For the above image I knew I wanted to be as high up as possible. The air was somewhat hazy because of fires, and during the day I noticed as I crossed Rainy Pass that the smoke was mostly hanging in the valleys. So I decided to spend the night at the top of Slate Peak, which at nearly 7500 feet is about as high as you can drive in Washington. The height helped me to shoot over the haze, and made the stars that much brighter. On the downside the top of a mountain does not usually offer a strong foreground element. There was a lookout tower, but I didn’t think it was interesting enough. SIMPLE COMPOSITION: This is of course a goal for all landscape photography, but for starscapes it might be even more critical. I mostly like to make the sky – Milky Way, comets, aurorae, etc. – the star of the show (pun intended). And when I use a strong foreground element I want it to share the spotlight. I want to wow people with the universe, which we don’t look at or think about very often. And so I went with the simple composition of Milky Way arcing over the North Cascades. I would have liked to have a better profile of the mountains, which are jagged and thus interesting in silhouette, but my viewpoint was much too high for that. It was a tradeoff between wanting to be above most of the haze and having the mountains in silhouette. I could have driven back down a ways after the sunset, but believe it or not I was nervous about trying to turn around at night from my precarious parking spot. It was a long way down. Also, a simple composition allows for a super quick and easy composite when you’re combining two shots (in this case one for the foreground and one tracking the stars so that they are sharp). SHARPNESS: One weakness of the shot is that the stars, while fairly sharp, are not perfectly round points. I was using my tracking mount (a Vixen Polarie) to track the apparent movement of the stars. This allows you to go much longer than the 20 or so seconds that you’re limited to when shooting from a regular tripod mount. Of course you can always raise ISO, and if you have camera like the Nikon D4 or Canon 1DX, you (a) have more $ than I do, and (b) have more flexibility and might not even need to track in many cases. The polar alignment you do for the Polarie is pretty basic. You simply point it at the North Star, making sure it’s visible through a little hole. Vixen sells a much more precise polar alignment scope for it, but for now I can’t justify the extra expense. For one thing, when you use a very wide angle lens, as I usually do, the slight drift does not cause noticeable blurring of the stars. But the longer your exposure, the better chance to get blurred or trailed stars. I’ve already mentioned a second weakness of the shot. It has no good foreground element, unless you count the mountains as foreground. I happen to think the city lights add enough interest, but it certainly can be argued that this is a stronger image with a good foreground element, perhaps illuminated by “light painting” (shining a light on the subject). EXPOSURE & PROCESSING: I was using my Tokina 16-28mm f/2.8 on a Canon 5D Mk. II, at 16mm focal length. I took two shots (actually three including the dark frame). One was with the tracking mount switched off, and the other had the mount tracking the stars. I shot both at the same exposure, but I don’t always do this, especially when there is a moon or other complicating factor. That exposure: 133 sec. at f/2.8 (largest aperture for that lens) & ISO 200. I shot the same with the lens cap on for the dark frame. I processed pretty simply. First I imported into Lightroom and worked on the image with sharp stars. I moved the highlights and the contrast sliders pretty high, moved the blacks lower, upped the shadows and clarity a bit, and added quite a bit of noise reduction and sharpness (with a healthy amt. of masking for sharpening). Then I used synch. to apply the same settings to the image with a sharp foreground. Then I opened this and zoomed in to the mountains to adjust both sharpening and noise until I had the best compromise. Then I took both into Photoshop, made the sharp mountain shot my background, selected the stars from the other one, and copied this over. I added a mask overlay and used a brush to clean up the horizon. In this simple case it only required a few long strokes along the mountain tops to reveal the underlying image’s sharp peaks. I zoomed in and looked around the image for the tiny red or green dots that indicate hot pixels, a common effect of long exposures in darkness. I didn’t see many, so I decided not to bother with dark frame subtraction. If I was to print this image at a large size, I would have done it. But for most things those hot pixels won’t show up. That said, it’s very worthwhile to always take a shot with the lens cap on, and at the same exposure as your real shot(s). It has to be at the same exposure as your main shot(s), and at or near the same time for the Photoshop technique of dark frame subtraction to work. Do it right after your main shot(s). Okay, hope you found this useful. I always appreciate comments and questions. I normally don’t do photography tutorials on my blog (too boring after awhile), and prefer to educate more on the subjects and locations I shoot in. But I will do this from time to time.